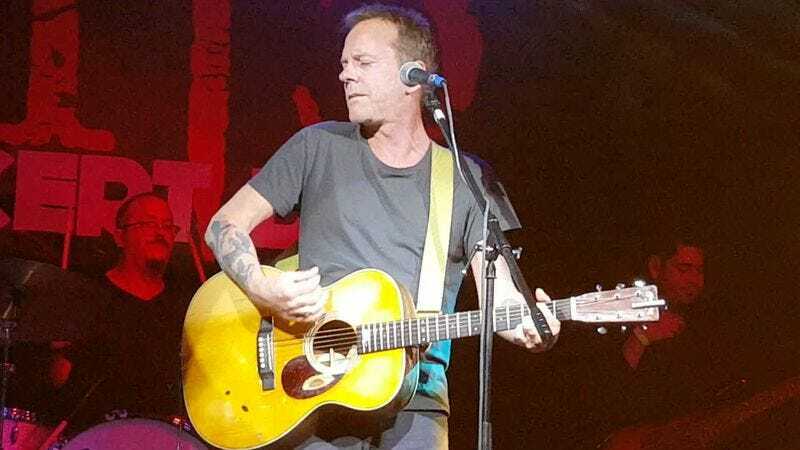 Kiefer Sutherland’s post-24 career has seen him finally play his father’s son onscreen, and now it looks like he’s set to accomplish another one of his longstanding goals: The actor’s just announced that he’s releasing his first album later this year, as well as kicking off a U.S. tour next month. Sutherland co-founded the Ironworks record label in 2002 to help aspiring musicians, a group to which he apparently belongs. But he took a break from the label in 2009, which was also around the time that season 7 of 24 wrapped on Fox. The songs on Down In A Hole reportedly draw from Sutherland’s personal experiences, not Jack Bauer’s, which means that the jugular-tearing will probably be kept to a minimum. But that also means we likely won’t hear the ode to Chloe that she so rightfully deserves.